Description Flag is a useful and beautiful modern dining table with a glass top and wooden legs. The glass top is lacquered in black or white, and can also be acid treated to give a matt finish. The legs are available in a number of wooden finishes. The wooden extension is lacquered to match the glass top. The metal frame is lacquered dove grey, anthracite grey, white or orange (please specify). 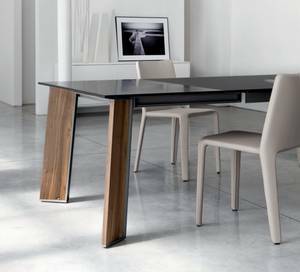 Flag is a superb new dining table from Bonaldo, it has a unique style that pushes the boundaries of new modern design. Flag is available in extending and fixed versions; the top, frame and legs are available in a choice of colours and finishes, allowing for a wide variety of different combinations. The metal frame can be lacquered in white or orange to stand out and really make a statement, or in dove grey or anthracite grey to blend in with the rest of the table for a more subtle look.